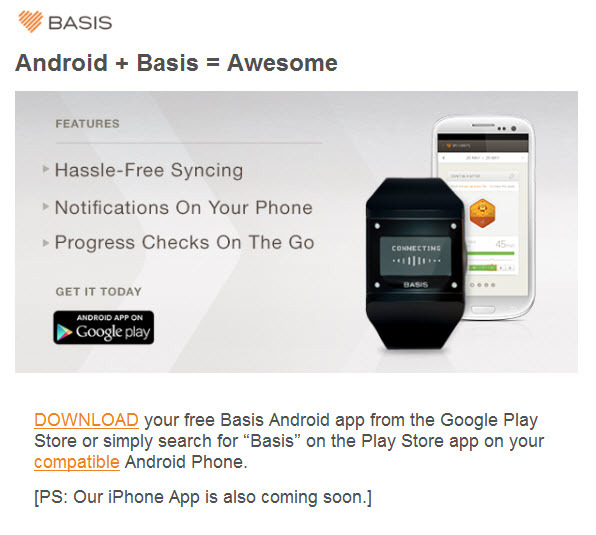 Basis Band – when is an “Android” app not actually so? If there’s one thing that’s come to define Basis in the last 18 months, it’s utterly useless communication. Totally and utterly appalling. Having waited a year for the Band past the initial delivery window, seen the utter debacle when it finally launched (they got thousands of orders for a mere handful of devices, and their website kept crashing when people tried to order), we now find that after waiting months past the launch window (surprise!) for the “Android” app that it is a hoax as well, as it’s only a Samsung app. One of the great things about a Nexus N4 is that it’s vanilla Android, but they haven’t even managed to support that. But what does the launch email say? Does it tell you that it’s a Samsung-only app? Has ANY of the information in the last few months ever mentioned that it’s Samsung-only? No, not a word – “Android App” is all it ever said, despite the fact that Basis KNEW it was being deliberately misleading, and would piss off a great number of people. Except that searching on the store DOESN’T show the app. Clicking the link shows why – it’s not compatible. What? A vanilla Nexus N4 isn’t compatible? How is this an ANDROID app then? It’s not – it’s a Samsung app. Seriously. So on top of managing to massively annoy all of the ultra-entitled-feeling iOS users by prioritising the supposed Android app over their devices, they’ve now managed to do the same to the majority of people that they said they were building it for by being late, deceptive and exclusive. You couldn’t make this stuff up. If Basis set out to be an example of how to do corporate communications as badly as possible from the outset I doubt that they could have succeeded as well as they have.